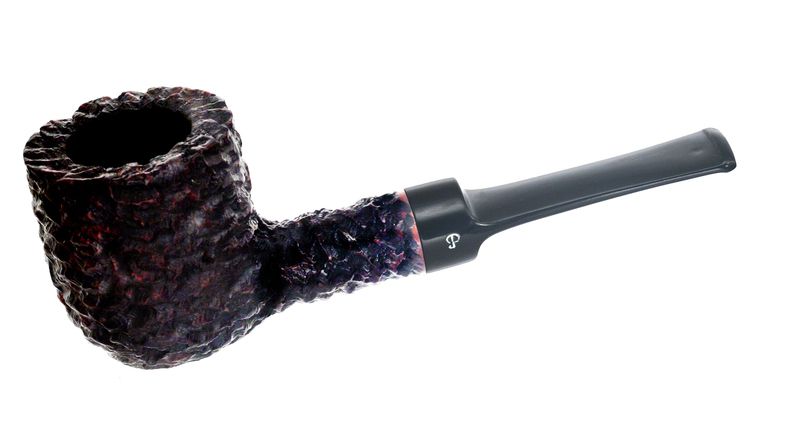 Late last fall Peterson rebooted the 406 Large Prince after an absence of twenty years, and just recently they’ve launched two new lines: the Aran Rusticated and the Rosslare Rusticated. Both are cause for excitement among Kappnists (aka Pete Freeks) and I hope will be of interest to fans of rusticated pipes as well. 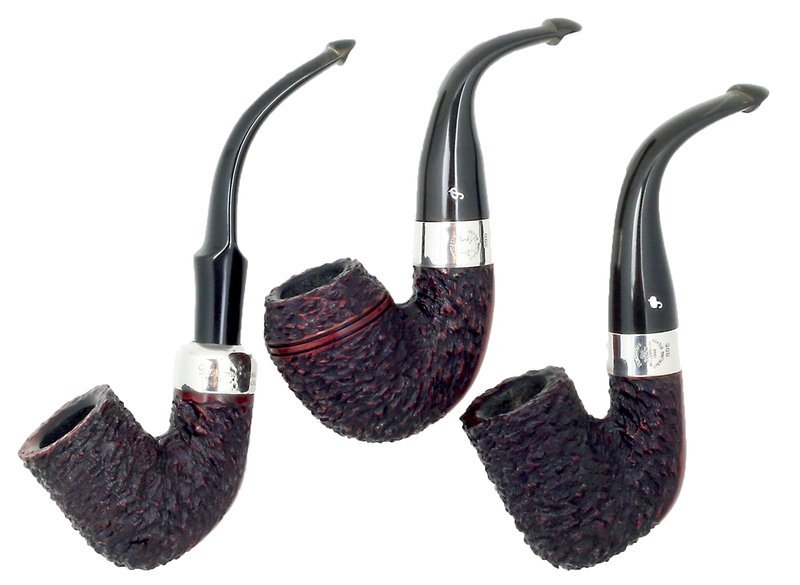 Like John P. Seiler and William D. Kotyk in their classic article for The Pipe Collector (Seiler_rough), I find comfort and a kind of heightened awareness when smoking rough pipes, pipes that talk to my thumb, index and middle finger. To shift analogies, it’s sometimes the difference between driving an automatic and a stick: with a good rusticated pipe you just feel more in control, more aware of the contours and nuances of the road. 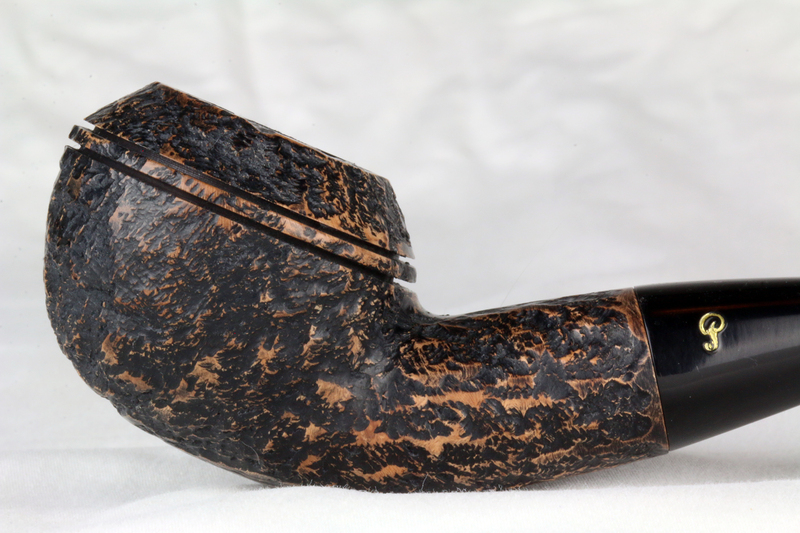 The history of Peterson’s use of rustication is, like so much else about the brand, long and varied and has gone almost totally under the radar of the hobby community. But let me start at the end with these two new lines and work my way back. Shortly after Laudisi took over management of the factory, we identified rustication as an area where we could make swift improvements in the pipes. We weren’t trying to do anything new. Instead, we wanted to restore the old Peterson tradition of making pipes with a craggy rustication rather than the overly uniform and shallow texture that had become more typical in recent years. There was a strong institutional memory and fondness for the old rustication among the craftsmen here, so we had a solid consensus around what we were trying to achieve. We’re all pretty happy with the results. 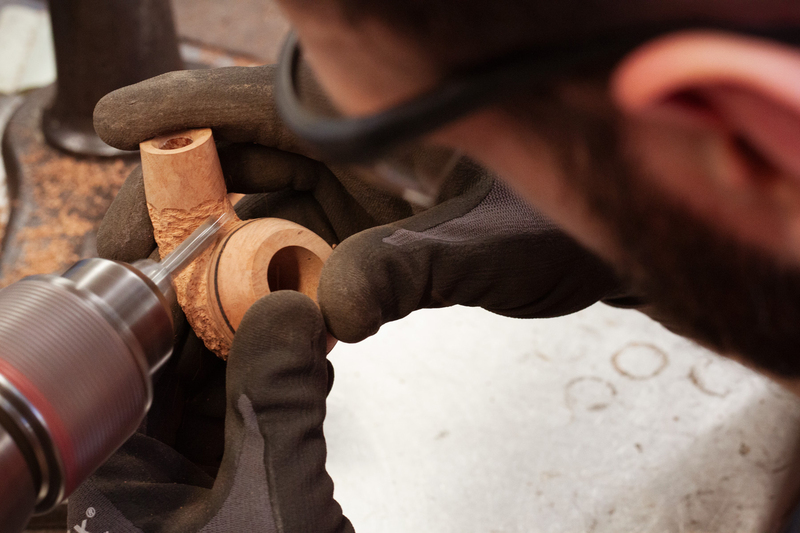 Rusticating pipes, as many know, is a time-consuming process. 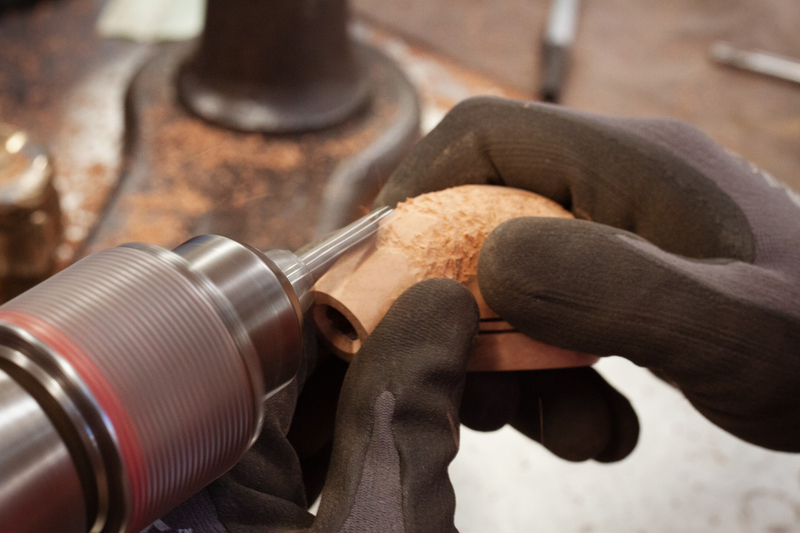 We have two gents in production who are particularly skilled at it: John Sinclair, who is a relatively new hire for us here, and Simon Ellard, whose primary responsibility is actually working with [silversmith] Jason Hinch in mounting. In addition to being time consuming, rustication is also physically demanding, so John and Simon tend to trade off on that station just to keep their hands rested. In addition to those two guys, Joe Kenny, our Pipe Manager and Senior Craftsman, also helps out with rusticating. So let’s take a look at the new lines, beginning with the Aran Rusticated. The Aran line goes back over 50 years, being issued originally as a rusticated line in 1965, reissued as a rustic in 1975 in some fascinating XL exclusive-to-line shapes, falling out of the catalog and then in the late 90s returning in the current smooth style, first with no band, then (at Mario Lubinksi’s suggestion) in 2010 with a nickel band, and now available either way. 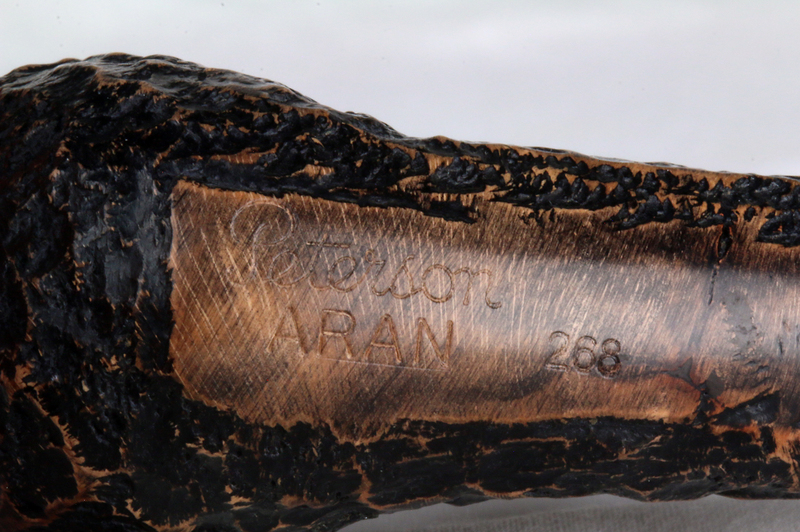 The Aran Rusticated features an espresso-over-caramel stain (about which more in a moment), soft hand rustication, the large Peterson script over ARAN hand stamp, hand-stamped shape number, a vulcanite fishtail mouthpiece with gold hot foil P.
The air hole and mortise of the two Aran Rusticated pipes I’ve looked at are completely free of stain, and there’s a new bowl coating being employed which looks very promising, with glossy finish and very light tacky feel. The line uses the original large ARAN hand stamp seen below. The 268 passed the pipe-cleaner test, the 999 did not, with drilling in the mortise just a tiny bit high. 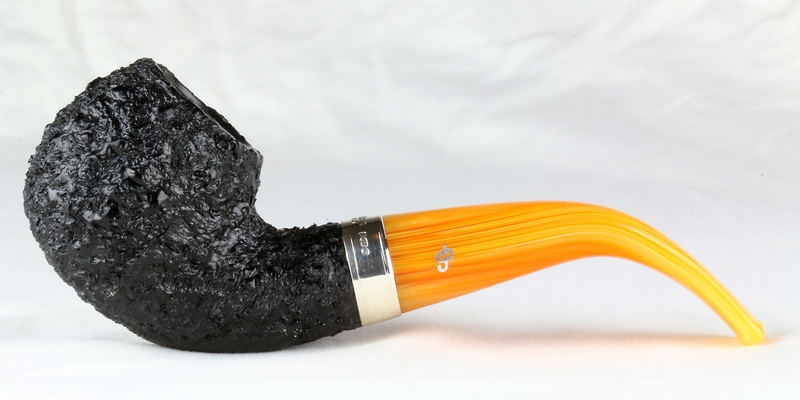 There is also, as everyone should expect in a pipe that retails for $76, a small peel of “tear away,” a wood flake caused by drill bit chatter when the draft hole was bored at the factory. This is easily removed with the swipe of a pipe cleaner or wire shank brush. For those who don’t know how factory pipes are made, these are common features of entry-grade pipes. 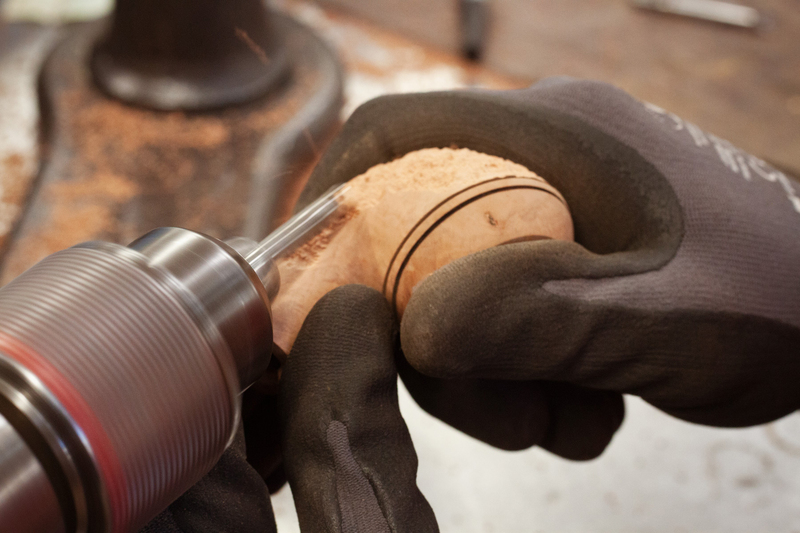 When bowls arrive at a factory, they’re already turned and have a tiny pre-drilled guide hole from the briar-cutter which serves as a channel for the airway boring in factory. 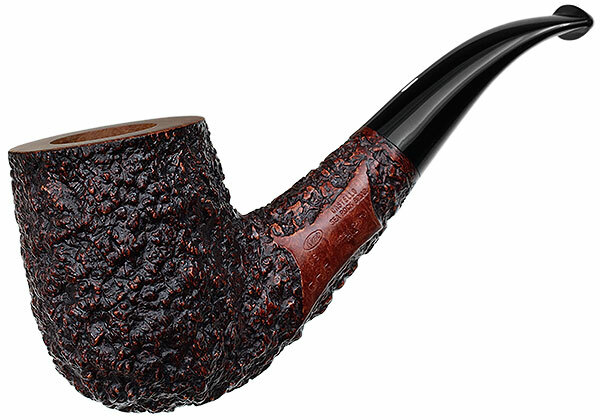 At about $76, the Aran Rusticated is a lovely entry-grade line, or what I call a gateway line, meaning that it’s a welcome mat for pipe smokers new to the hobby as well as providing an opportunity to acquire some great smokers (and lookers) for those who can’t or don’t want to invest a lot in their pipes. Now back to that stain. I hope you’ve taken a few minutes since April Fool’s Day to watch Adam Davidson (Smokingpipes) and Jeremy Reeves (Cornell & Diehl) hilarious Farm to Bench about Adam’s unexpected crop, because this will make perfect sense in that context. It was all I could do to restrain friend Charles Mundungus, here on a visit, from hopping a flight to Adam’s farm. 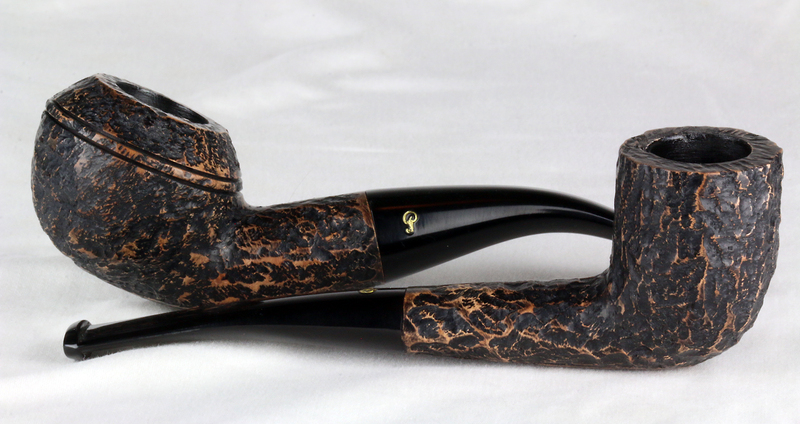 I say this because the Aran Rusticated sports one of the neatest natural “camo” looks I’ve ever seen on a pipe. These pipes look like someone just turned them up out in his garden or found them tucked a snag on the trail of the North Rim of the Grand Canyon. The effect to the naked eye—which I did my best to reproduce here—is outstandingly natural, unlike most anything I’ve seen Peterson (or other companies) do before. They’re the kind of pipes you want in your pack for a day hike on the Giant’s Causeway, in your tackle box for the first smoke at dawn on the lake or just in the pocket of your old jacket, because you never know when you’ll need one. Is there a downside to this pipe? I can only think of one: I wish I could get one with a P-Lip. 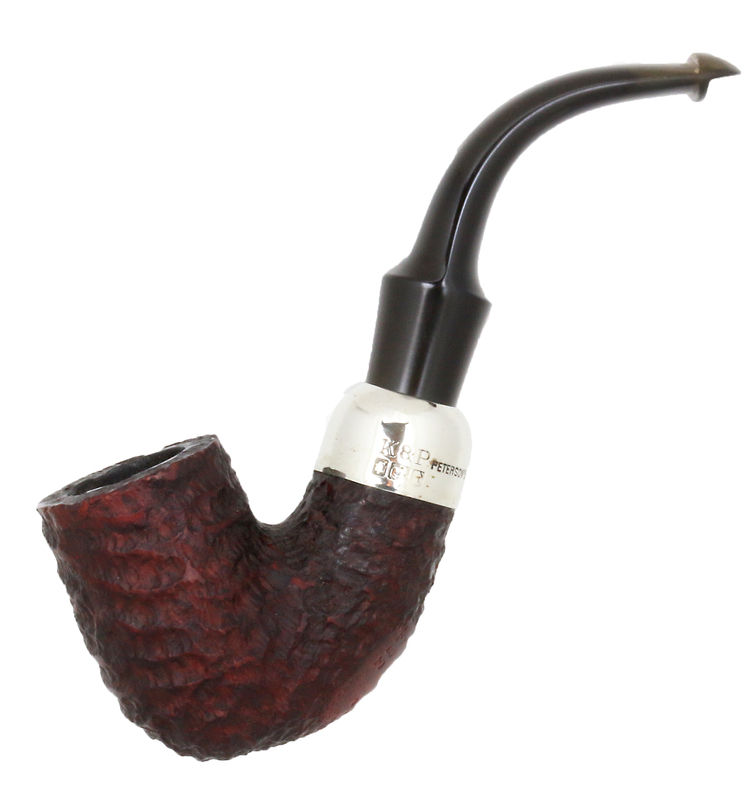 Until then, I’ll have to content myself with the 107 Chubby Billiard fish tail shown below, which I couldn’t resist ordering yesterday. 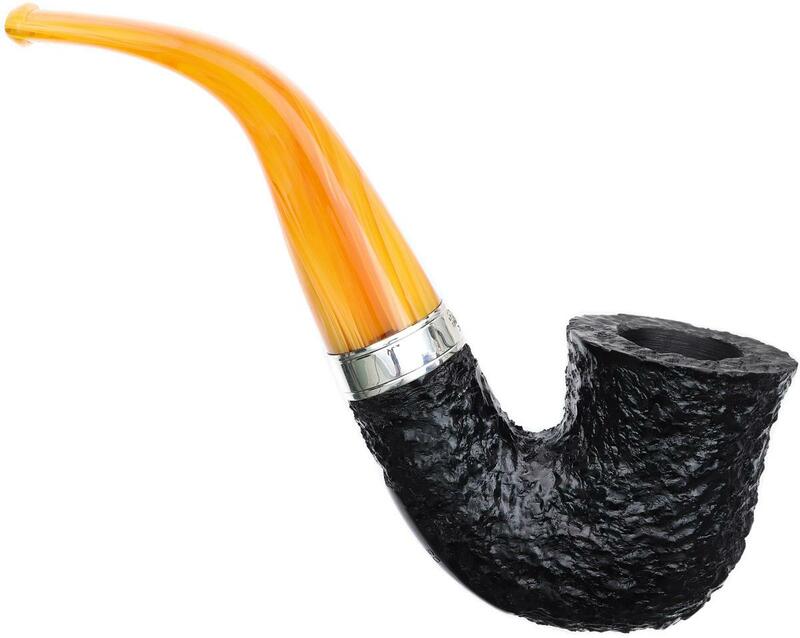 The price, the soft hand rustication, the comfortable old-style vulcanite mouthpiece and engineering of air hole and chamber all indicate this new line as a great value. 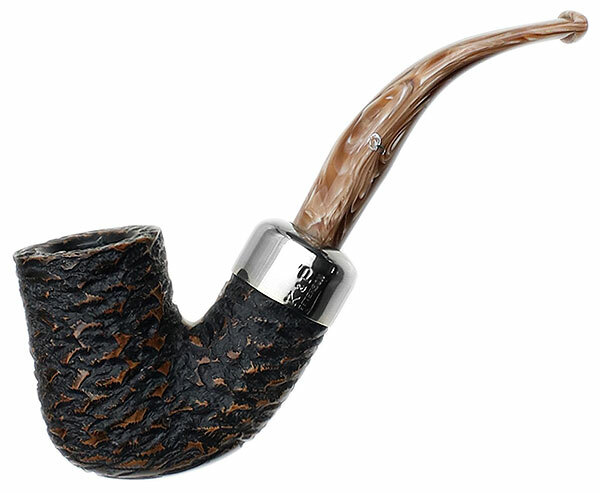 The Rosslare has been one of my favorite Peterson lines since its debut in 2003 when it was known as the Rosslare Royal Irish (with the faux sterling spigot ring). 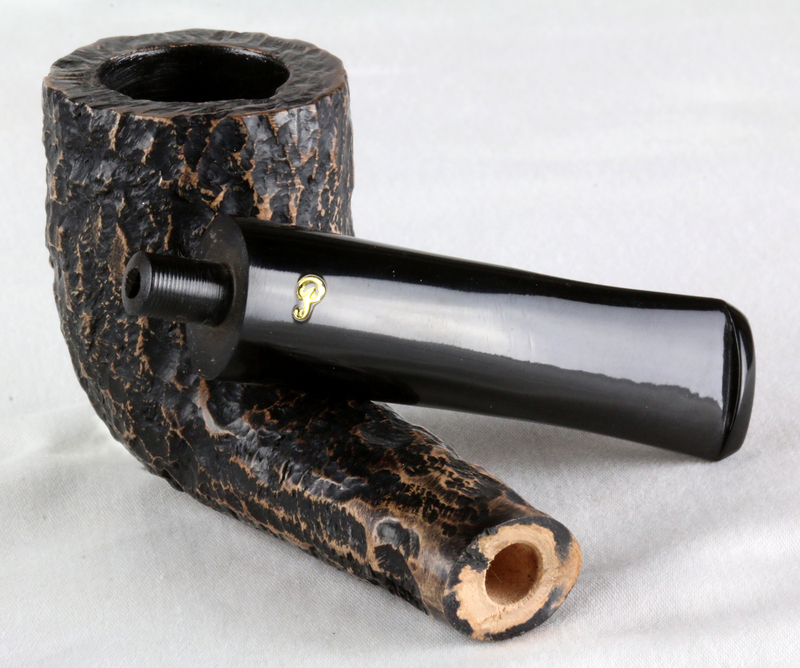 The black sandblasts came a year or two after the high-grade smooths, if memory serves, and made a perfect contrast between stem and bowl (those of you who remember the Jobey Strombolis of the late 1970s will remember an early attempt at this type of thing). 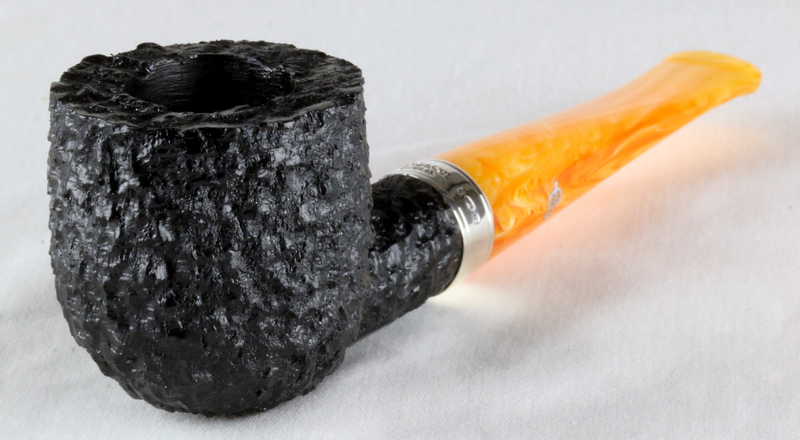 I remember some American pipemen caviling about the Rosslare’s “marmalade” acrylic mouthpieces, not knowing that acrylic was (and is) preferred by Italian smokers, nor that it was intended by Peterson’s creative collaborator Mario Lubinski as an homage to Peterson’s own early manufacturing history of amber mouthpieces. 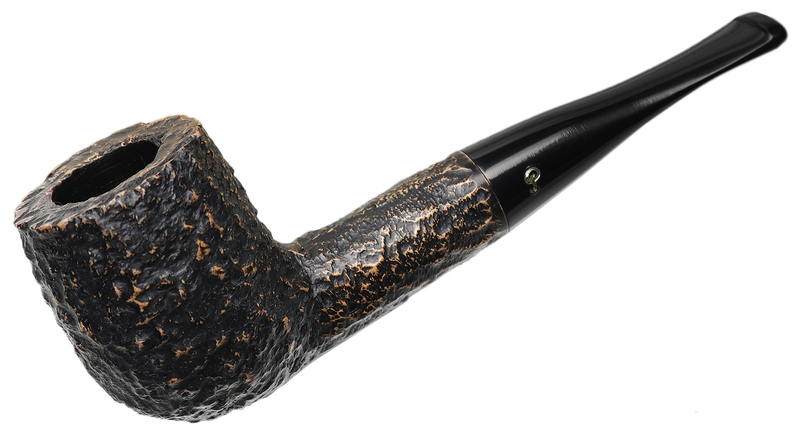 The Rosslare Rusticated is an upper-grade Peterson line featuring a black, semi-gloss craggy thumb-stopping rustication, double-bead sterling band stamped Peterson in script over DUBLIN. 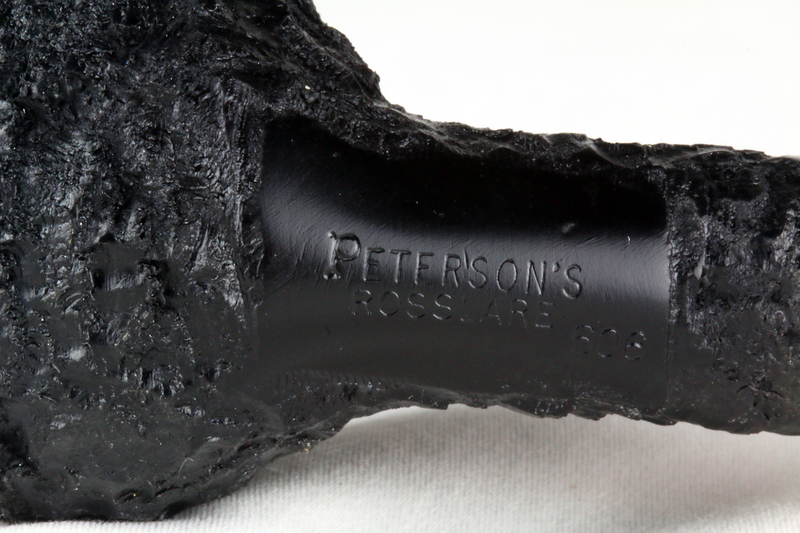 The bowls are hand stamped with the original fork-tail P block-letter stamp used on the first Rosslare: PETERSON’S [larger] over ROSSLARE. The acrylic rod on both pipes I looked at in person—an XL02 and a 606—have fantastic striations along the sides, giving depth and transparency to the color. Ever the indicator of mid-to-higher grade, the stems feature the embedded aluminum P. These are retailing across the pond for about $135 and should be available here in the US most any day now. It makes me daydream about the same craggy look on a System. As with all things Peterson (and I’m sure this can be said about other factory-made pipes as well), look before you buy. These are, after all, hand-made products—there’s only two artisans who do the rustication at Peterson, and as Josh Burgess told me, the wood’s hardness will have its say in what can be done. Some bowls can take a deeper rustication than others. And the same goes for acrylic rod—it’s all fairly random within certain perimeters, so be choosy, find one that speaks to you. Seeing a rusticated pipe in a blog post and holding one between thumb and fingers is obviously a difference between map and territory, so about the best I can do here is give you an opinion as to where the Aran and Rosslare fall in the broad spectrum of Peterson’s rustication history, which stretches at least as far back as the 1930s. The oldest example I can show you here is an Éire-era 363 System (1938-48). Using “closed eye visuals” (as Charles Mundungus’s Swedish friends in Meshuggah would say), the pipe’s feel is pleasant and hillier than the new Aran. Visually it’s also quite striking because of the way it seems to have been rusticated by hand (and not a drill bit) with a knife. Can you imagine the time and skill that would take? It boggles. But the first true rusticated Peterson line was the 1945 Donegal Rocky, which deserves a full-length exploration as one of the Great Lines. 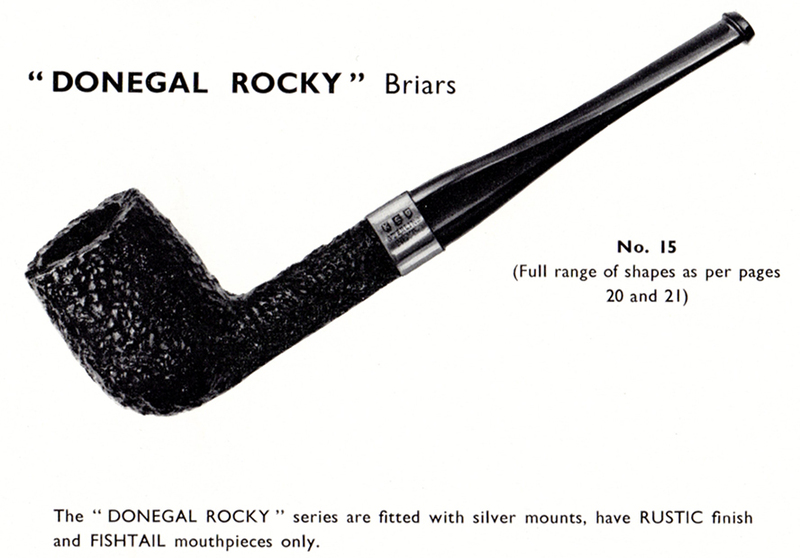 For now, it’s enough to note that the Donegal Rocky originally had a sterling band, concrete evidence of the company’s pride in its texture, and that was the day-in, day-out, meat-n-potatoes Peterson standard. 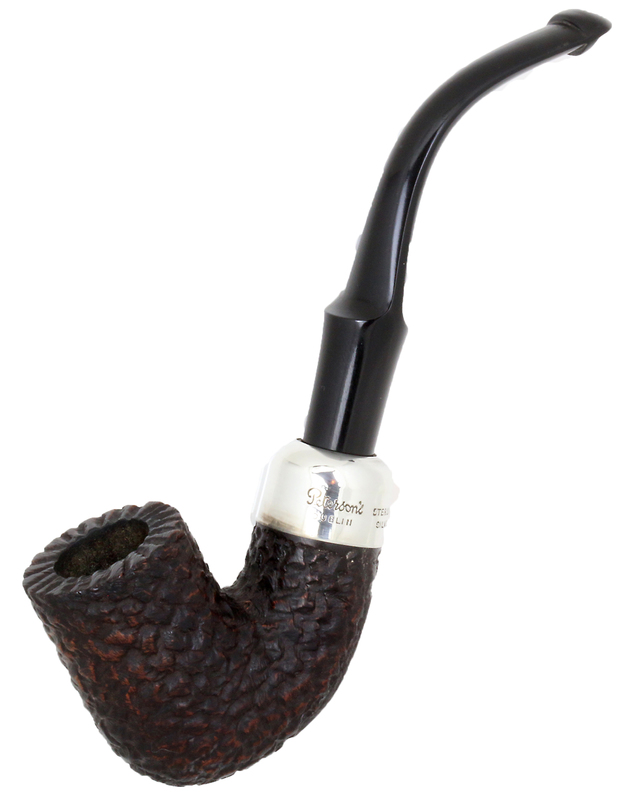 I will say that as the line has come down to us over the years, as a rule of thumb the sterling-mount iterations (almost always with P-Lips back in the day) are to be preferred, if only for the precious metal and standard P-Lip, the rustication itself not being markedly different throughout all its years until the sad “pineapple days” of the latter Dublin Era. And to be fair to the company, they redeemed themselves quite a bit with 2016’s Derry Rustic line. It was fabulous for combining a decent-enough rustication technique (machine-cut?) with a contrast stain, cool acrylic rod and best of all, some fantastic and out-of-the-way killer B shapes and others long-gone from the catalog like the XL339 shown above. 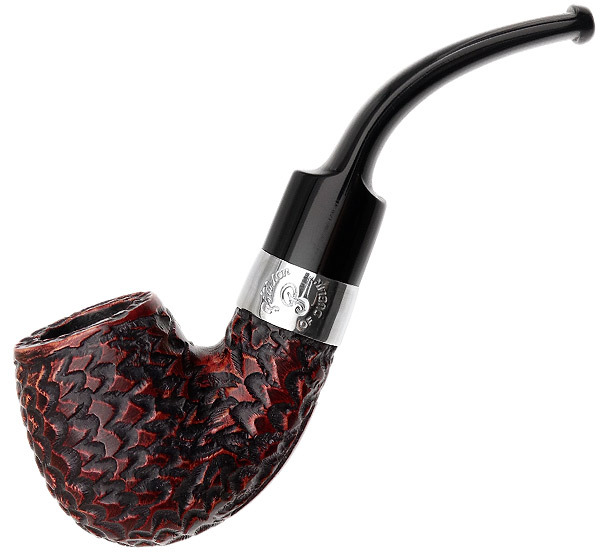 So that’s what all the fuss is about with the new Rosslare Rusticated and Aran Rusticated pipes. Turn the page. 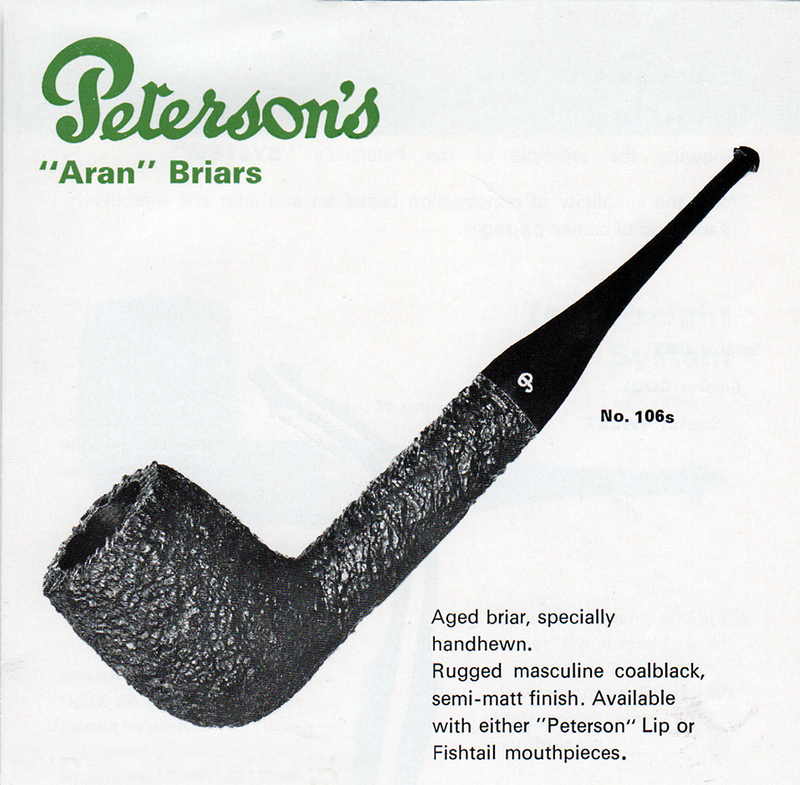 The Aran pictured above in its first release in 1965 looks to be a much finer-textured rustication technique than the classic Donegal Rockys, but this could just be my imagination. 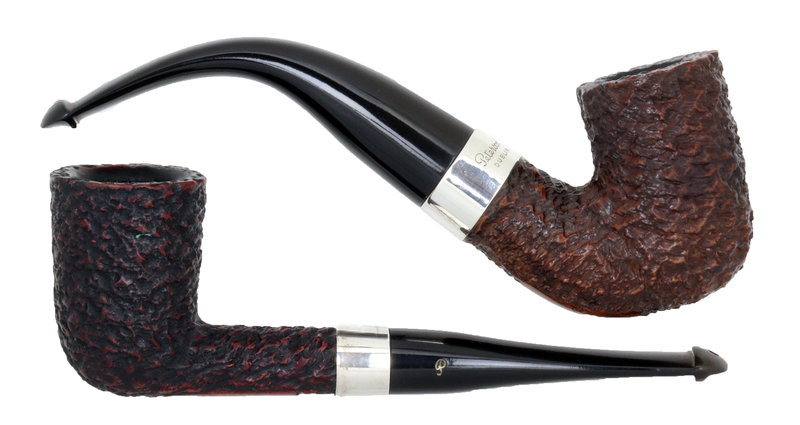 When the line was re-launched in the mid-1970s, it featured a much rockier, knubblier pipe than its predecessor, as befitting several of the special XL shapes utilized in it (seen above in the 30S pot above). 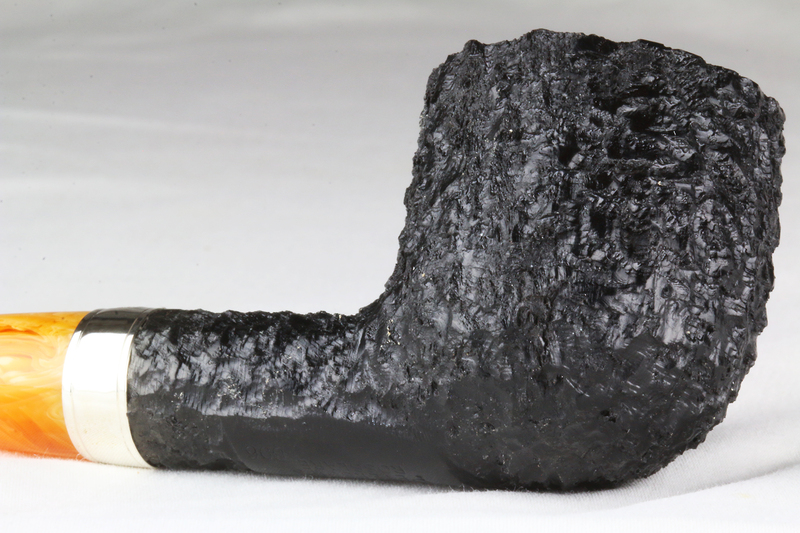 A deep, craggy rustication technique found on high-grade Peterson pipes in the 1980s and ’90s, the best in Peterson’s history. 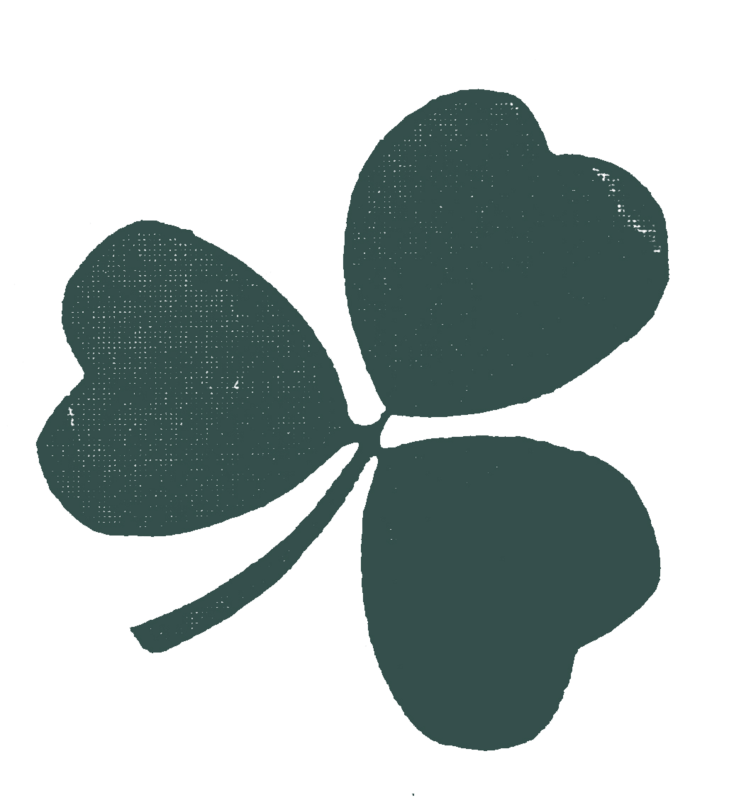 Found on the Dublin Millennium, P-Lip Commemorative, Handmades, Sherlock Holmes series and Connemara Systems of the period. When I asked then-factory manager Tony Whelan, Sr. about these back in 2009, he told me they were out-sourced to a very talented artisan during that period.